Many today talk about a "mechanism of interiorization" (A. Borrely), which affirms that "a monk is hidden in the heart of each person" (R. Barile). We are reminded that the first of "the great specialized journeys" is constituted by the "Monastic Life," which, therefore, is presented as the "formative journey" by which all Christians should be inspired in disciplining their spiritual life (Card. M. Martini). If holiness is also measured by the up-to-date teachings and examples of the one who has incarnated it, we have to say that Anthony Mary Zaccaria would be speaking the same language to us. It has been said that the future belongs to people marked by the experience of the divine. This is exactly what Anthony Mary inculcates upon his disciples, be they lay, religious, or cleric living under the discipline of a rule. To the laity of his Cenacle in Cremona, a center of renewal he had founded, the very young Zaccaria was pointing out the old program of life: "Now if man is upset or full of noise from the outside, how is he going to be in the house? Remember that Christ said, 'When you pray, go to your private room - that is, your heart — and shut the door, that is, your senses — and then pray to your Father in secret, and He will reward you'" (Sr II, 88). Man is urged to "come back to the heart," where the true I is hidden, and is called to be God's temple: "I will prepare my heart for God in all truth, in all simplicity, and in all sincerity. May he dwell in my heart forever through His grace and make it His temple" (Sr, II, 119). Therefore, the whole spiritual life will consist in disciplining our exterior senses, and in developing "your interior efforts," as Anthony Mary writes to his disciples working in the Vicenza mission (Lt VI, 36). Once back to his own very self, the spiritual man is capable to see "interiorly" again (Lt XI, 46) which the estrangement from the practice of contemplation has almost totally erased from our forehead: "The eyes of mind and of spirit ... in most men these eyes are blind, and in all men they are rather hesitant and disaccustomed to see" (Sr IV, 110). To go back to the original familiarity with God, "let us often elevate our mind to God," which Zaccaria recommends to the layman Carlo Magni (Lt III, 24), and to the Omodeis (Lt XI, 55). He reminds these last ones that it is not enough "to pray for one or two hours," but what is needed is to "often ... elevate (the) mind to Christ," with whom we have "to converse and chat interiorly" (Cs XII, 180), so as to reach a state of "continuity in prayer" (Lt III, 25), or, according to a saying taken from St. Gregory the Great’s "Pastoral Letter" (2, 1: PL 77, 27), to be "always recollected" (Cs XVIII, 198) in prayer. 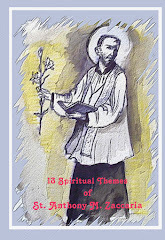 Anthony M. Zaccaria is a great master of "interior Prayer" (Cs X, 168), which will shine in those who know how "to be recollected" (Cs XII, 18), who know how to frequently visit the secret dwellings of the heart, according to an expression used by Gregory the Great to describe the spiritu­ality of his holy patriarch Benedict of Norcia. But how does one reach such a demanding style of life? The condition is readily given: we have to reach "stability" of mind (Cs IX, 166), since "man by nature has a wandering mind" (Lt III, 24). Anthony Mary had learned from Gregory the Great that the "instability of the mind" is caused by the "original transgression" and it "has become like a second nature" (Moralia 26,44, 79: PL 76,395). This is why the great Doctor compares the mind now to water, now to a mill, now to a reed. "I fit is channeled, it goes up, since it has a tendency toward where it came from; if it is left to itself it gets lost, because inevitably ends up to the bottom" (Regola Pastorale 3, 14: PL 77, 73). "Any mundane business is comparable to a grinding wheel which, accumulating many worries, makes the human mind whirl wind, and constantly produces in the depraved hearts the flour of unending thoughts" (Moralia 6, 16,25: PL 75,743). Also Zaccaria uses the same comparison when he preaches that "the mind is like a water-mill" which grinds good and bad thoughts according to what we put into it (Sr II, 88). And finally: "the reed represents the mobility of the mind" (Moralia 33, 3, 7: PL 76,673). "Heaven and earth, Gregory the Great affirms, contend for the dominion of the mind" (Ibid. 10, 10, 17: PL 75,931). It follows that we must not give the demon the opportunity to stir up our mind into a state of alienation from God: "Keep away ... from distractions ..., knowing that the devil is used to overpower those who are distracted" (Cs VII, 163). Now "the mind will reach its stability, if it polarizes itself on that one thought on which it wants to concentrate. The mind will reach stability only if it does not get swept away by the changing pressure of numberless stimulations" (Moralia 26, 44, 79: PL 76,395). This entails a constant interior work which would allow us to "reap the fruit of a pure mind" (Cs XII, 179). "The mind," Gregory the Great said, "has always to be emptied" (Moralia 31,27, 53: PL 76,603). 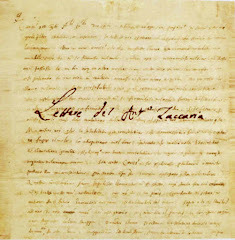 Zaccaria echoes him as he recommends to the novices an absolute simplicity in their interior judgment, under the penalty that they would not "empty their mind of fantasies" (Cs XII, 179), or when he enjoins them "never to form during Prayer any fanciful images" (Ibid., 176), that is not to substitute contemplation with what is a pure excitement of the senses. To reach the silence of the mind it requires arduous discipline. Gregory the Great affirms, "Our mind is in no way drawn to the purity of interior contemplation, if it does not quiet the uproar of earthly desires" (Moralia 5, 31, 55: PL 75,710). But how could this be possible for us who are "enraptured by the things which are visible and always present, and even necessary" to us? (Sr IV, 108). How can we overcome the "enchantment of the exterior," as Pope Paul VI says? He himself gives us the answer: "The fascinating image ... absorbs almost the whole of our interior life ... It fixes itself in our memory to move then in our mind; if it is constantly pursuited, sometimes with an obsession, than it will substitute the speculative thought, it will be crowded with vain fantasies, it will stimulate it to imitation, it will make it exterior, reducing it to the level of the sensible world. 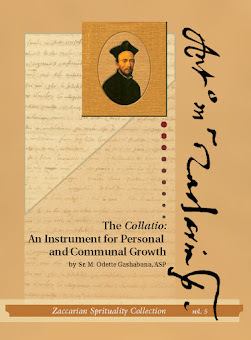 How can spiritual life, prayer, suspension to the First Principle, that is God, find room in a con­science crowed with habitual importation of images, often futile and harmful?"